F.I.L.A. (Fabbrica Italiana Lapis ed Affini), founded in Florence in 1920 and managed since 1956 by the Candela family, is a highly consolidated, dynamic and innovative Italian industrial enterprise and continues to grow market share. In November 2015, F.I.L.A. listed on the STAR segment of the Milan Stock Exchange. The company, with revenue of over Euro 422 million in 2016, has grown significantly over the last twenty years and has achieved a series of strategic acquisitions, including the Italian Adica Pongo, the US Dixon Ticonderoga, the German LYRA, the Mexican Lapiceria Mexicana, the Brazilian Lycin, the English Daler-Rowney Lukas and the French Canson. F.I.L.A. is an icon of Italian creativity globally through its colouring, drawing, modelling, writing and painting tools, hanks to brands such as Giotto, Tratto, Das, Didò, Pongo, Lyra, Doms, Maimeri, Daler-Rowney and Canson. Since its foundation, F.I.L.A. has chosen to focus on growth through continuous innovation, both in technological and product terms, in order to enable individuals to express their ideas and talent through tools of exceptional quality. In addition, F.I.L.A. and the Group companies work together with the Institutions to support educational and cultural projects which promote creativity and expression among individuals and make culture accessible to all. F.I.L.A. operates through 21 production facilities (of which 2 in Italy) and 40 subsidiaries across the globe and employs approx. 7,000. FILA HELLAS SA is the subsidiary covering the presence of FILA GROUP on the Balkan peninsula. 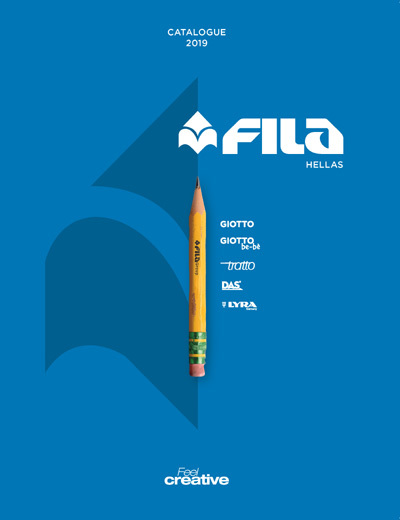 Based in Thessaloniki promotes in recent years the presence of Fila products in almost all Balkan countries. Exports and presents all product ranges of FILA GROUP in Romania, Bulgaria, the Former Yugoslav Republic of Macedonia, Kosovo, Montenegro and Serbia. Since its establishment in early 2014, is responsible for the distribution of products throughout the Greek territory, covering all levels of the market.